Tram #3. Three were held, one as a spare for emergencies. Colour scheme was royal blue and white. Garden seats with reversible backs were used, face to face (a novelty and popular). Room for 13 passengers inside and 18 outside. 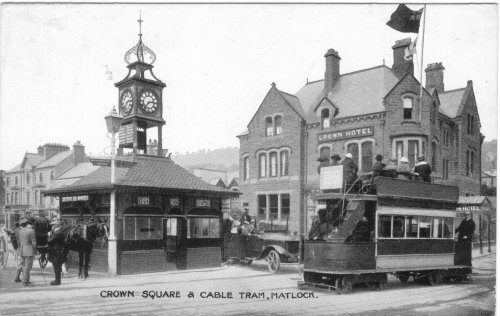 The official opening of Matlock cable tramway, 28 Mar 1893.
from an unused postcard published by C.Colledge, stationer, Matlock. (Thanks to Alan Ankers for an exciting auction and a generous scan). Another angle on the passing point at Bank Road/Smedley Street (see photo X220). 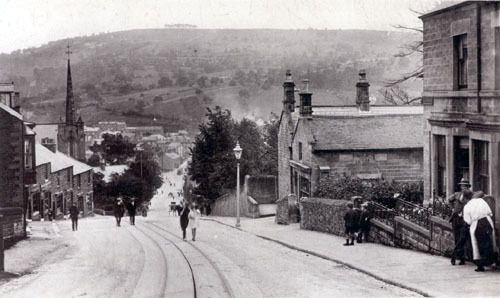 The route up Bank Road. How does the driver know when the cable starts to pull? 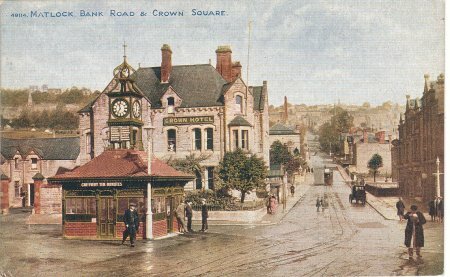 The Tramway opened in 1893 and closed in 1927. 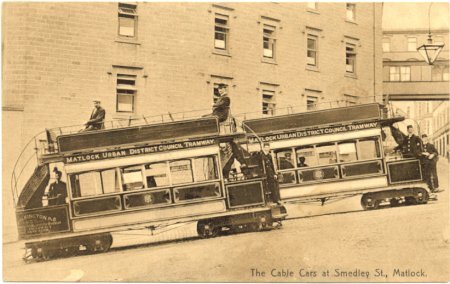 It carried passengers between the railway station and the famous Hydros of Smedley's and Rockside. 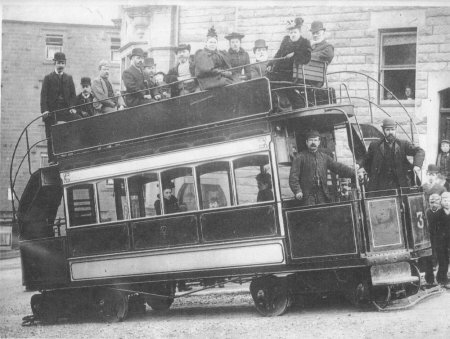 The tram was the steepest in the world (on a public road), 1 in 5½ (18%). So steep that the two trams (one going up, the other going down) were pulled by a cable running under the road. 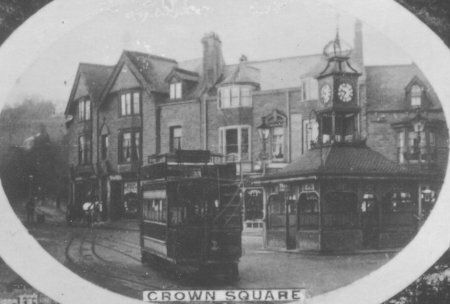 The trams went from Crown Square to Rutland Street, up the very steep Bank Road. 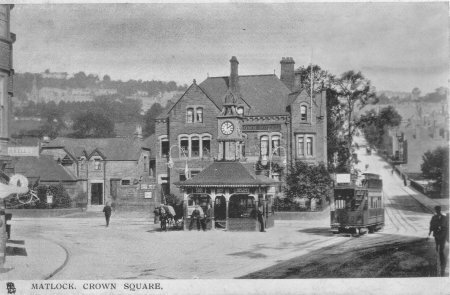 Originally the route was planned to start at the railway station, close to the River Derwent, but because of the danger of flooding the terminus was moved to Crown Square. 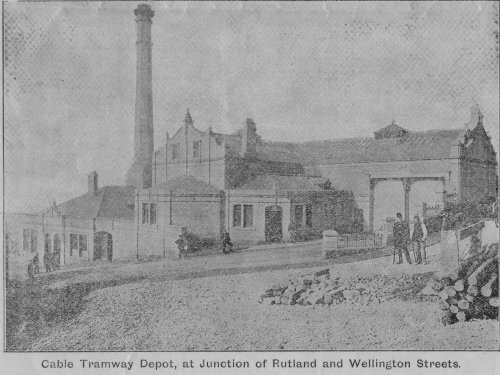 The Depot in Rutland Street contained a boiler and stationary steam engine, which pulled the cable and lifted the tram 300 feet up Bank Road in half a mile. Fares used to be "Two pence up, a penny down". 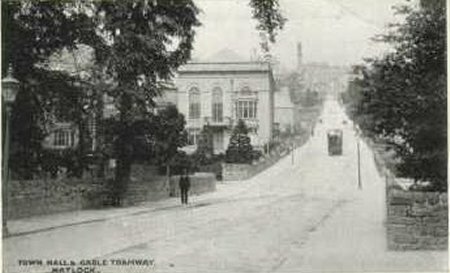 Bank Road was not wide enough for two tracks, so a single track was used, with a "passing place" where the trams met (see photo). The up and down cables had to run in the same tube between the rails. 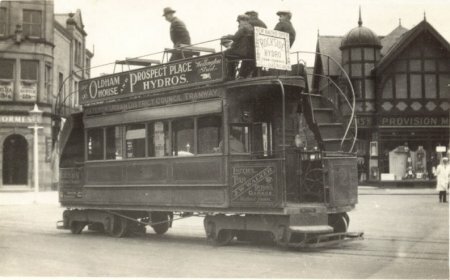 The trams averaged 5½ mph, and had the advantage of the down-tram balancing the-up tram, and saving power in the Depot steam-engine. A spare tram was kept in the Depot in case of need. More photos of the tram on Photo 189. 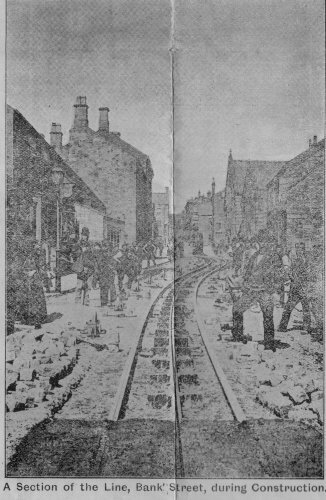 The resident engineer Edward Marks, and his brother Croyden Marks had to overcome many engineering problems, such as: turning circle, dirt blocking the gripper channel, water freezing in the channel, cable stretch, communication between trams, noise problems. 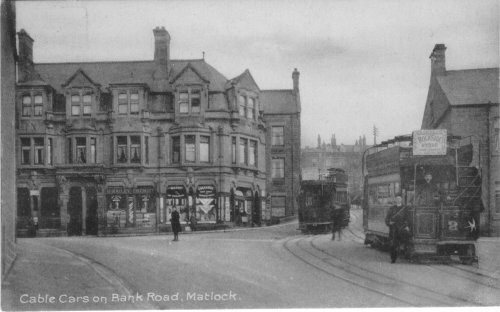 It is said that Job Smith got the idea for a steep-gradient tram for Matlock while in San Francisco in 1862. 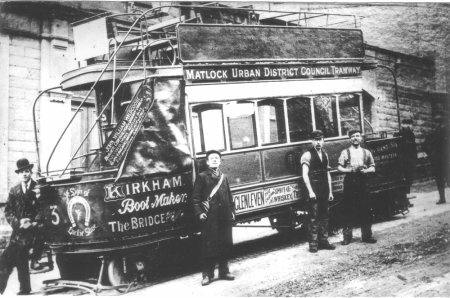 Some men who made the famous tram work, and should not be forgotten, are: George Hallam (driver), Charles Foster (engineer), Charles Killick (driver), and John Parker (conductor). "Ye sign of Luckie Shoe"
Estimates given. Jobbing Work done. At Crown Square, looking towards the Bridge. Compiled, formatted, hyperlinked, encoded, and copyright © 2005, All Rights Reserved.